Concentrate on the stories and the details that help tell the stories of these Saturday Evening Post cover illustrations. Point out differences in MOOD. Point out that all of the pictures together tell us a story about one particular young, naive soldier, named Willie Gillis, who goes off on his own into a scary world. Willie is a soldier during the time of World War II. We see Willie experience many new things as a soldier and most of them are amusing. We watch as Willie grows up, from the fall of 1941 to the fall of 1946. The last picture in the series, five years after the first Willie Gillis cover, shows the returned veteran, now a mature adult and enrolled in college. Average Americans could relate to Willie Gillis because so many of them had soldier sons, brothers and sweethearts across the ocean in a foreign country themselves. Rockwell painted Willie as the son any mother would love and every father could be proud of. Willie was a way of relieving the stress for American families whose own beloved sons were courageously defending the rights of freedom. In America, Norman Rockwell is the best known artist who has ever lived. Illustrators weren’t considered in the same category as major artists until Norman Rockwell. In 1963, a major Art Gallery in New York City displayed Norman Rockwell’s illustrations in their front window. This told the world that the famous illustrator was TRULY an artist! Norman Rockwell painted the good that is universal in humankind: humor, loyalty, compassion for others, pride in country and love of family. His pictures boosted the spirits of people in the 1940’s and helped them keep the war in perspective. His illustrations reflected the principles for which the war was being fought while at the same time reminding Americans not to take themselves too seriously. 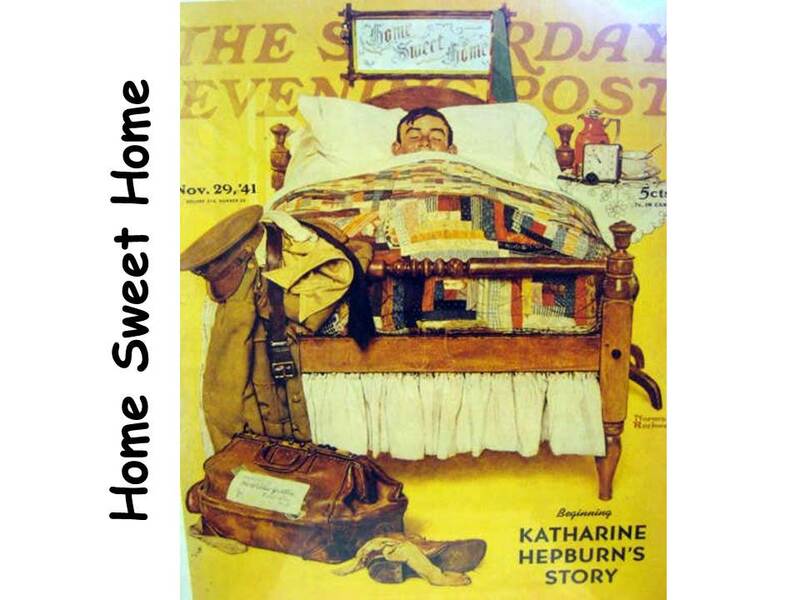 When a Rockwell illustration included soldiers, they were usually doing common activities such as opening mail from home, enjoying leave and feeding a hungry child. Some of his best pictures are the ones that chronicled life on the home front while the war was waged across the seas. Whoever they were and whatever they were doing, Rockwell’s subjects always seemed to be putting into practice the ideals of a free society. Rockwell once said, “As I grew up…I unconsciously decided that, even if it wasn’t an ideal world, it should be so, and so I painted the ideal aspects of it.” While the real world of today may not be as Rockwell painted it, his pictures provide us with a much-needed vision of what the world SHOULD be. In Willie Gillis Rockwell made America see the glass half full instead of half empty. The war was a terrible thing for many families. Rockwell’s pictures gave them encouragement and let them know they were not alone. All of America was straining from the sacrifices the war forced on them. Norman Rockwell was born on Feb. 3, 1894, in New York. To gain acceptance, the resourceful Rockwell drew pictures to entertain his classmates. He left high school to study at the National Academy of Design and earned money by drawing greeting cards. At age 16, he studied at the Art Students League and began illustrating books and magazines. By the time he was 18, Rockwell was the art director for Boy’s Life magazine. When World War I broke out, young Norman Rockwell tried to enlist in the Navy but he was rejected for being underweight. The military doctor suggested he eat a diet of bananas and donuts, with lots of water, until he gained the ten pounds he needed to be accepted into the service. After he was accepted, Rockwell was assigned to the navy yard in Charleston, South Carolina, where he painted for the Navy. 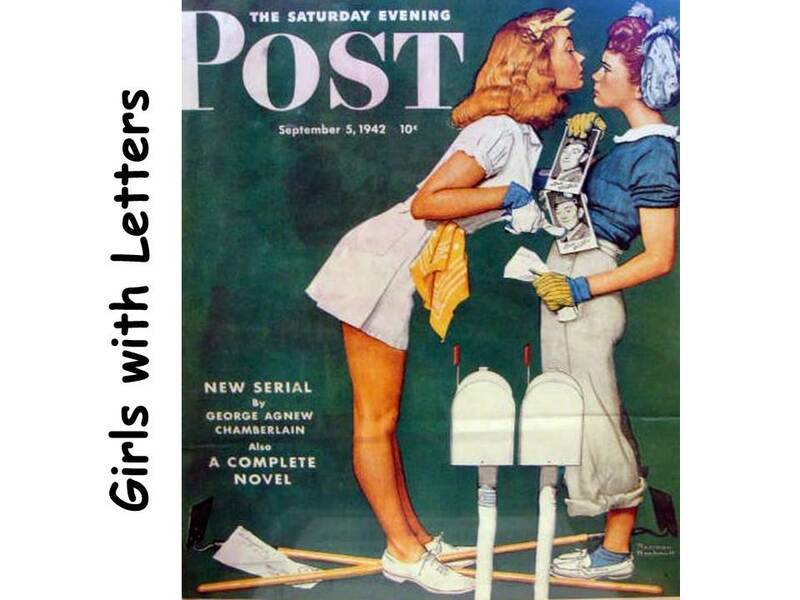 He also continued to work for the Saturday Evening Post and other magazines. After the war, Norman returned to New York where he built a studio for himself. By that time, Norman was enjoying both fame and fortune from his paintings. Norman Rockwell painted covers for the Saturday Evening Post for 47 years and provided 318 total covers for the magazine. The Willie Gillis character was created for some of these Post covers. Norman would usually set up a scene in his studio for the picture he was going to create. He insisted the details of the background be detailed and accurate. Sometimes he would send his wife all over town just to find the right shaped chair he had in mind for a particular scene. Rockwell hired his friends to pose for him in his scenes. Some models had to pose for hours and days at a time. Later in his career, Norman would take photographs of the models so they didn’t have to pose for him for such long lengths of time. The process used by Norman Rockwell to create a painting was long and detailed. First, he sketched the scene. Next, he made individual drawings of each object in the scene (such as people, furniture, books, tablecloth, etc.). Full-size charcoal drawings were the next step, followed by color sketches. Only then was he ready to begin the actual painting. The pictures for the Post covers were painted on very large canvases. Rockwell felt the only way the scenes would look good, when shrunk down to the size of a magazine cover, was to create the original paintings large and full of detail. In the late 1930’s, Rockwell moved to Arlington, Virginia. Fire destroyed his studio in 1943, along with many of his drawings, paintings, props and costumes. Norman Rockwell painted his last Saturday Evening Post cover in 1963. Once he hung up his paintbrush as a full time activity, Rockwell spent his later years traveling and visiting foreign countries. He died in 1978. Ask the class to look at the painting to see if they feel it tells a story. Help kids begin to “read” the painting by identifying the people and objects they see. Ask the class to focus on the details of the picture that give clues to the story. • What story does the painting tell? • Who is (are) the main character(s)? • What do you think happened just before this scene? • How do you think the people in the painting feel? • What can you see in the painting that makes you think they feel this way? Discuss the different ways the painting allows everyone to have their own interpretations of the story. Norman Rockwell’s artworks inspire viewers to participate in the story by using their own imaginations. Ask the class to use their imaginations and pretend they are inside the painting. • What would it be like to be part of a (noisy, happy, silly, sad) scene like this? • Where would you be standing or sitting? • What can you see from this spot? • What can you hear and smell? • Do you feel warm or cold? • Can you feel the breeze or the sunlight? • What else can you feel? Help the class identify various details and objects in the painting. Ask them to explain why these details are important. How do these objects make the scene seem real? Remind the class that Norman Rockwell created these scenes to tell stories without using words. 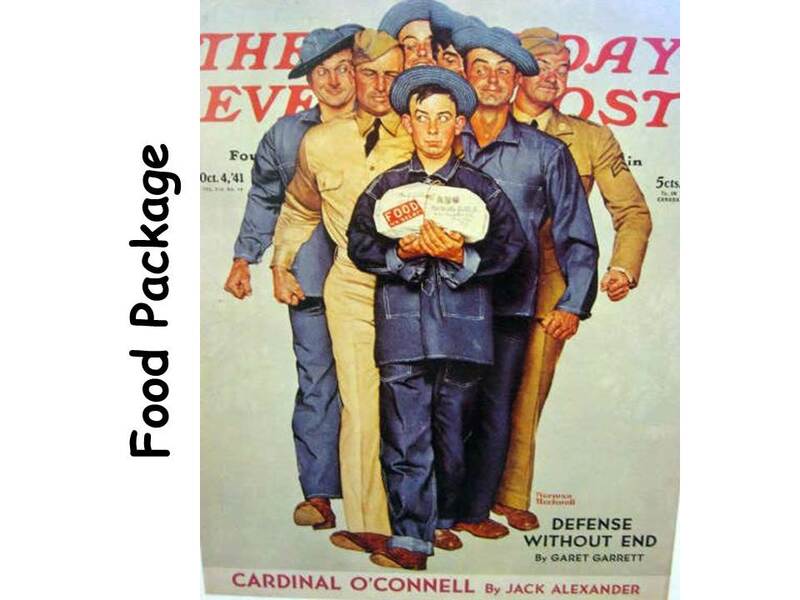 After the first draft call, but before Pearl Harbor, Rockwell planned a series of Saturday Evening Post covers about one soldier, a quiet, lovable young innocent who could be anyone’s son or kid brother. For a model, Rockwell wanted someone likely to remain in Vermont for the entire series and at a local square dance, he happened to land on the ideal candidate: Robert Otis Buck, who had been exempted from the draft because of stomach surgery performed some time before. Rockwell went to Fort Dix, in central New Jersey, to study the uniforms his subject would be likely to wear. He also bought a complete GI outfit “from boudoir blues to the ballroom browns,” which he intended model Bob Buck to wear on every occasion. The first cover in the series presents a newly drafted soldier receiving a package from home. Needing a name for the address label on the package, Rockwell consulted his wife, Mary, who came up with the name “Willie Gillis,” after thinking of a book she had read to her children called Wee Willie Winkie. 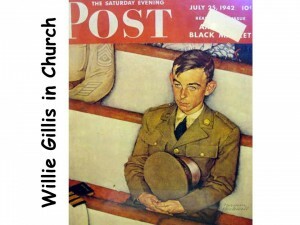 Attentive Post readers pointed out that the Gillis package from home showed insufficient postage and from then on Rockwell weighed in his packages and letters at the post office before he painted any stamps—an important detail since so many of Rockwell’s wartime covers included mail to and from home. 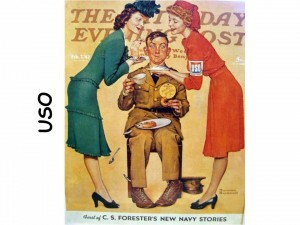 When Rockwell planned this series, he did not anticipate that there would be so many covers related to the war. 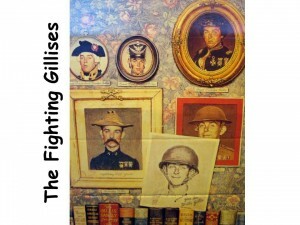 The ten Willie Gillis covers that followed this one represent a running narrative of the war years as seen through the experiences of young Willie Gillis and those who loved him. Look at the faces of the soldiers standing behind Willie. Notice their expressions. Where are they looking? What do you think these soldiers are thinking? What clue did the artist give us about what is in the package? Notice Willie’s face. Where is he looking? What do you think Willie is thinking? Who can share with us the story this picture tells? What COLORS are repeated in the picture? What SHAPES are repeated? 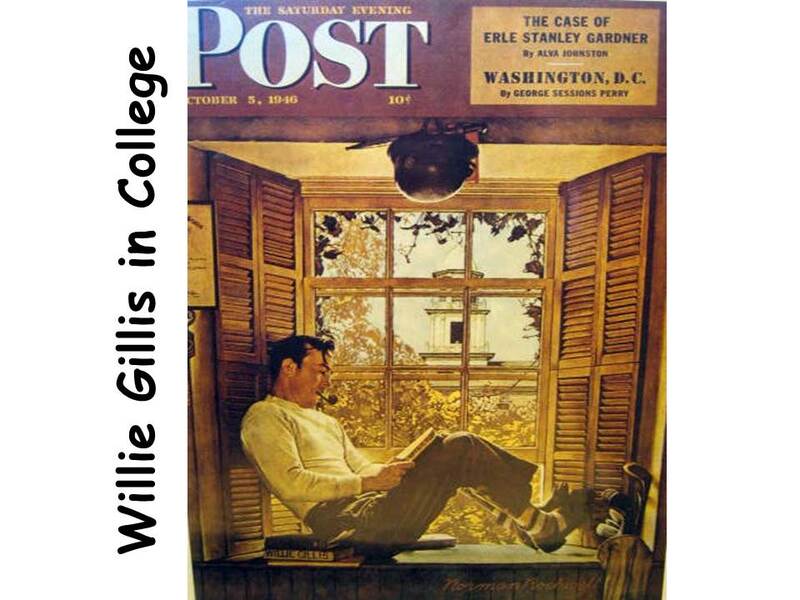 The reception to the first Willie Gillis cover was so great that Rockwell immediately set about doing the next. He continued the series with a theme that recurs frequently throughout the war: coming home. Only a month after the first Willie Gillis cover, and still before Peal Harbor, Rockwell brings his favorite private home on leave. From the very outset, Rockwell reminds us that the heroes defending the nation are still everyday people who want to come home to their loved ones, to a country at peace. • A Still Life picture is an arrangement of objects that an artist paints. In general, almost any object can be included in a Still Life as long as it is inanimate (nonliving). Bring in a pair of men’s shoes (like Willie’s) and a pair of socks, to arrange on a table as a Still Life scene, for the kids to draw and paint. If you have a bag like Willie’s, set it up with the shoes to make a more interesting arrangement. Being waited on by two stunning volunteers from the USO, Rockwell’s innocent war hero is off to a great start. Here the artist introduces another recurring theme: the soldier engulfed by the new experiences he encounters away from home. Through Rockwell’s telling, these experiences are touching and often humorous. 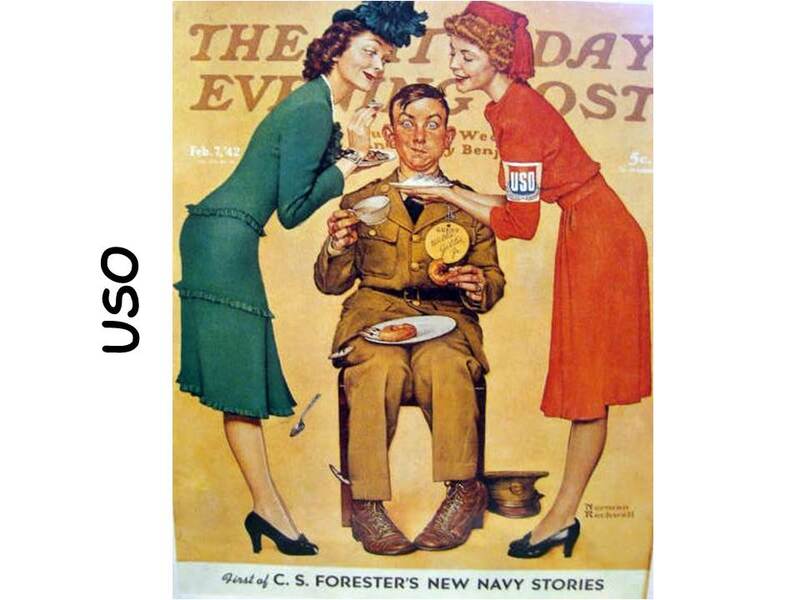 USO’s were established in 1941, on various U.S. military bases, to support the soldiers. Young women served as hostesses and dance partners to soldiers who were usually a long way from home or any familiar faces. By now, Willie had become a favorite with the Post readers (and the first two oil paintings in the series were already hanging in the Fort Dix new Service Club Library, on loan from the artist). Rockwell started on the third image just before leaving for a change of scene in California. He made sketches of Bob Buck, and then completed the painting on the West Coast, where he hired two female models, the blonde-haired woman having been selected by the Navy as one of the six most beautiful women in Hollywood, during the 1940’s. Being away from home could offer some marvelous new experiences, but more often than not, home seemed very far away to a young recruit. Rockwell’s portrayal of homesickness appears frequently during the war, reminding those at home of their importance to the boys over seas. By the time the United States entered the war, Willie Gillis had become a symbol of the American soldier, and throughout 1942 he appeared even more frequently. He had become so popular that 2,500 enlarged reproductions of all Willie Gillis covers were being distributed by the USO to railway stations and to clubs located in the States and overseas. Willie Gillis was even selected to promote the sale of United States savings Bonds. Do you notice how plain the background is? Why do you think there are no details in the background? Willie could be anywhere in the world. It makes the picture universal to every American who has a soldier away from home, whether overseas or in the states. Pretend you are a Newspaper reporter. 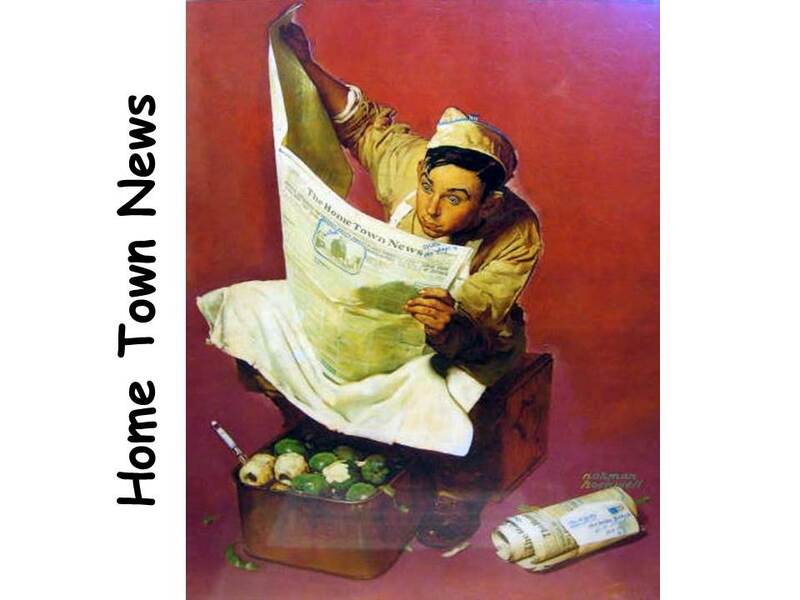 Write an article for a Hometown News front page story. Draw a black and white photo (with sharp pencil) to illustrate the newspaper stories on the Hometown News page handout. Write about what happened when farmer Brown’s cow ate Mrs. Butterworth’s apple pies that she had cooling on the window sill. Alternatively, you could write about another silly small town situation that your imagination can dream up. 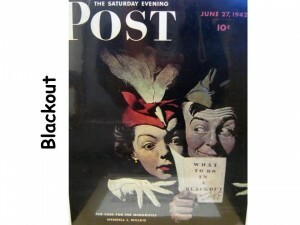 Rockwell was able to transform the frightening experience of a blackout into a playful excuse for fun. During WWII, if an air raid siren went off in the evening, everyone got into their homes, turned out the lights and blocked the windows so light couldn’t be seen from outside. Air raid drills were done all over the U.S. during the war, in case enemy planes were to fly over the U.S. If all the lights were turned off, America hoped to protect her citizens from bombardment by not letting the enemy know where the populations were. Air raid drills made the American public nervous and fearful. By finding something fun in a scary but familiar scene, Norman Rockwell helped to reassure the American public that was poised for disaster. Since everything is so dark and there are not many objects in the scene, what did the artist do to bring attention to the cover? The bright red color of the girl’s hat, in the very center of the picture, repeated in her lipstick, draws us into the picture. The white feather and the point of her hat point our eyes downward to the white pamphlet and the girl’s white gloves, causing MOVEMENT getting our eyes to explore the entire picture. The expressions of their faces create the MOOD of the scene. How would you describe the way Willie is feeling? What about the girl? • Write a journal entry describing what Willie felt like during an air raid drill. Willie might mention the way he was afraid of the dark, his thoughts about hiding from the enemy, his hopes that America would never be bombed the way so many towns and villages in Europe had been. Willie might write what he was doing before he heard the air raid siren. Was he at the movie with the girl in the picture? Was he walking down the street alone? Did he impress the girl with his knowledge about “what to do in a blackout”? What did he do after the drill was over? Choose a date before June 1943, because that is when Willie is pictured in India, so he wouldn’t have been in the States. • (K-1) The girl in this picture has on a silly hat. Hats were very popular for ladies during Willie’s time. Everyone wore hats when they went outside in those days. Willie has a hat on too. It might be fun to make folded newspaper sailor hats with everyone. Another idea would be making silly hats. Send a note home, a few days before you visit, asking parents to help by sending things to decorate the silly hats. Ask for artificial flowers, paper doilies, lace, ribbon, colored yarn, sequins, pom poms, old jewelry, fabric scraps, etc. Things like this can often be found around the house. Give everyone a paper plate to decorate and add ribbon or yarn so the hat can be tied on for everyone to show off when they are finished. Younger kids will love this one! • Use colored chalk on black construction paper to draw a close up picture of two people in the dark. Leave the background black and concentrate on the people. Show them doing something, such as lighting a match to start a campfire, wearing pajamas as they find their way out the bedroom door, accidentally pushing a teddy bear off the bed, looking at stars, fishing in the early morning before the sun is up, riding a bus to work before the sun is up, delivering newspapers on an early morning paper route, etc. Willie Gillis gave Norman Rockwell a way to express a wide range of sentiments that reflected the intensely emotional times Americans were living in during the early 1940’s. By the middle of 1942, Willie had become a familiar figure who brought a smile of affection to most Americans. Here Rockwell presents a more serious aspect of Willie’s life as a soldier—a reminder that what lies ahead for a soldier is not all fun and adventure. While Willie is very much alone in his apprehensiveness about the future, Rockwell makes it clear that other men—regardless of rank or service—are also caught up in their private thoughts of what tomorrow holds. Where is Willie? It looks like a church pew. There is a hymnal on the seat beside him. Willie is the only person in the picture. We see hints of others near him. In front of him there is the shoulder of a navy uniform. Behind him an Army sergeant is seated. Yet, Willie looks far away from anyone. He looks alone. Why do you think Norman Rockwell made him seem so alone? It gives a message that a soldier is alone as he goes off to war. Even though there are many people around him, he is alone in his feelings. Soldiers have to keep up a brave front. Willie probably wouldn’t say anything about his fears to any of his soldier friends. He would have to seem fearless. What do you think Willie is thinking? He looks very serious. He could be thinking about the friends and family he will miss; how scary it is to go so far from home alone for the first time; how scary war is; will he be hurt in the war? He could also be having a conversation with God (a prayer) about it all. What kind of MOOD has Norman Rockwell created in this picture? Serious—look at Willie’s face. Point out how most of the other pictures create a lighter, sillier, fun kind of MOOD. What did the artist do to create the MOOD of the picture? In this picture, Willie’s face is extremely serious. Most of the pictures have a silly or happy mood. In Food Package there seems to be a nervous mood, created by Willie’s face. The facial expressions do a lot to create the MOOD, along with what is going on in the picture. In the last picture, Willie Gillis in College, Willie’s looks are drastically changed with his civilian clothes and he is calm and mature. There is a quiet MOOD. Willie also has matured physically, because his arms are more muscular. Having Willie grow older this way creates a mood of security—America and Willie are safely at home. By the middle of 1942, Willie Gillis had become such a favorite with Post readers that he was the central attraction even when he was absent from the picture. We don’t know what kind of hero Willie may have been on the battlefield, but we do know that he was a hero with women. The two women who are competing for Willie’s affections are actually sisters, the daughters of Rockwell’s good friend and neighbor, Mead Schaefer. Willie has sent each girl a postcard with his picture on it. Each postcard has the same picture on it and the same “Love” Willie. Since their mailboxes are right next to each other, they must have gone out to get the mail at the same time and noticed they each had the same postcard. Do you think Willie wrote the same thing to each girl? Discuss some of the things a soldier might write home about. • Write a postcard to or from Willie. It could be a postcard from one of the girls in the picture. It could be a letter from Willie. It could be a postcard from one of Willie’s parents, or brother, or sister. The front of the postcard will need a picture. Discuss things to draw on the front of the postcards. If it is sent to Willie, it should be something that will be supportive and encouraging. It could be a scene from a tourist place in the United States, since Willie is so far from home. It could also be a Fourth of July celebration, a patriotic scene, a photo of his family, a photo of his dog, or cat, or horse. If it is from Willie could be a scene from a place overseas. Discuss the different countries Willie could have been in during WWII. The picture on the postcard could be a colored map of the country Willie is writing from. Postcard letters are shorter. Willie could also send a postcard home to mom and dad. What would he write if he were sending a postcard to them? Address the postcard as if it were real. Draw a stamp where the stamp should go and use the address from the picture. Put the address in the proper place on the postcard. Put your own return address in the proper place. Use larger size note cards to make it easier to have space to write. Draw a picture on the front of the pretend postcard. • If you know someone who is in the service and far from home, kids can make postcards to send them. Some of the kids may have family members in the service. Check with the class ahead of time, to find out addresses. Maybe the kids could make postcards for several soldiers. Younger kids could just draw uplifting pictures to send. With news that the allies were moving on the offensive in 1943, Willie Gillis began to shift gears. By now he was a more seasoned soldier, no longer the shy recruit pining for home. 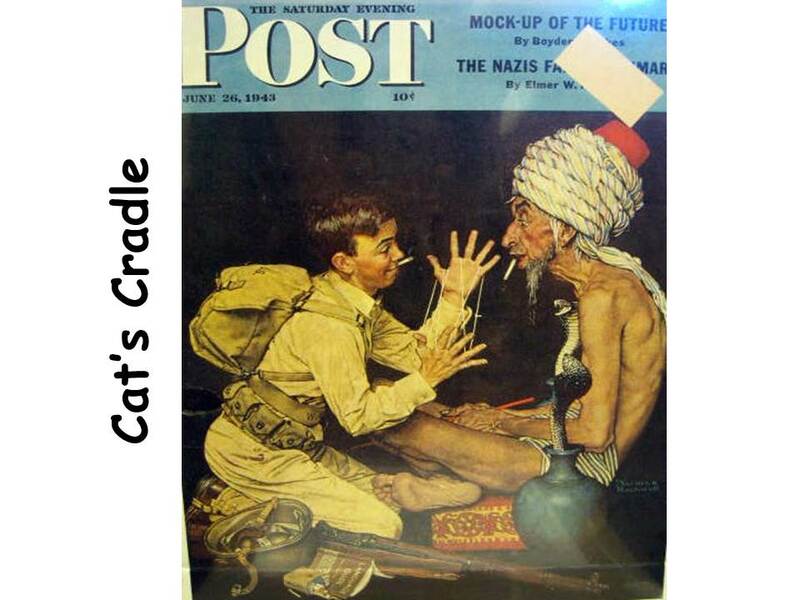 Nevertheless, Willie remains a gentle warrior, playing cat’s cradle with an Indian fakir. While the war was raging at a fierce pace, Willie Gillis never lost his humanity, a reassurance to those who worried about what was happening to their loved ones on the front. Norman Rockwell wanted to comfort worried mothers about how their sons were doing, so far away from home. 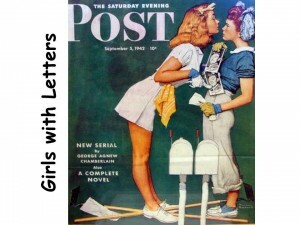 How do you think he accomplished that with this Saturday Evening Post cover? By having Willie play a game like cat’s cradle, Rockwell shows the young boy inside Willie Gillis. The soldier’s gun, helmet and the cigarette represent the young soldier carrying the responsibility of a grown man. Rockwell also pictures Willie with an old man. The Indian fakir (snake charmer) has a gray beard, gray hair and wrinkles. One of the things Norman Rockwell did in many of his pictures was show the contrast of old age and youth. The fakir seems very interested in what Willie is doing. Look at his expression! • Draw a picture that contrasts old age and youth, a favorite subject for Norman Rockwell. Draw a picture of yourself doing something with a grandparent or an older person you know. • Write dialogues between the snake charmer and Willie. Make small copies of this picture to attach to the kid’s written dialogues and display them together. Offer a prize for the most creative one. • Discuss some of the other parts of the world Willie might have been during WWII. How would the people from those countries look? How might they be dressed? What types of things might they have done? Have kids draw a picture of Willie in another part of the world, doing something with a person dressed as they would be dressed in their country. Point out that when they draw Willie, his uniform is all one color and even his belt, backpack and helmet seem to be much the same color. Although he had been exempted from the draft, Bob Buck (Rockwell’s model for Willie) felt he couldn’t simply stay at home while a war was going on. To his dismay, Rockwell lost his Willie Gillis in 1943, when Buck enlisted as an aviator (pilot) in the Navy. The Post reported on this turn of events by saying, “While Bob Buck was becoming one of the better known Army figures because of Rockwell’s pictures, Buck was riding Navy planes based in Los Alamitos, California, as an Aviation Ordinance man, third-class.” Lacking a real model, Rockwell had to improvise to keep the Willie Gillis series going. 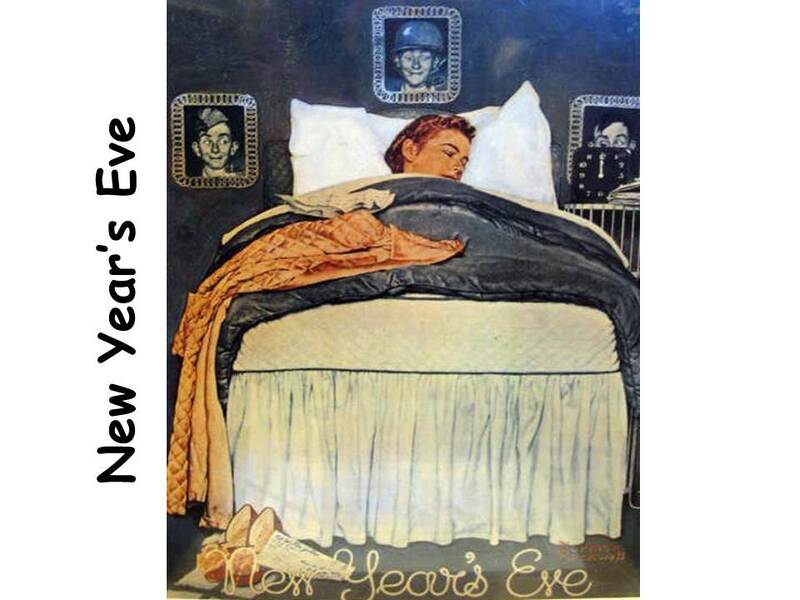 Referring to several headshots taken before Buck left, Rockwell placed portrait photographs on the wall above the bed, where Willie’s girl (Mead Schaeffer’s daughter again) is sleeping through New Year’s Eve. Did you notice the way the artist led our eyes through the picture to pick up all the clues that are painted to tell the story? Look at the photos of Willie. What are Willies eyes looking at in all three of the pictures? We see an envelope on the floor by the girl’s shoes. She probably fell asleep with thoughts of Willie on her mind. New Years Eve is usually a night that people stay up late to celebrate and greet the New Year. Why do you think Willie’s girl has gone to bed so early? Willie has gone off to the war and she has no one to celebrate with. Cut photos of people’s faces from magazines. (Avon and fashion magazines have lots of close up faces) Cut the faces in half vertically and glue one half to a piece of drawing paper. Have kids draw the other side of the face. This is a great project to introduce SYMMETRY AND BALANCE. 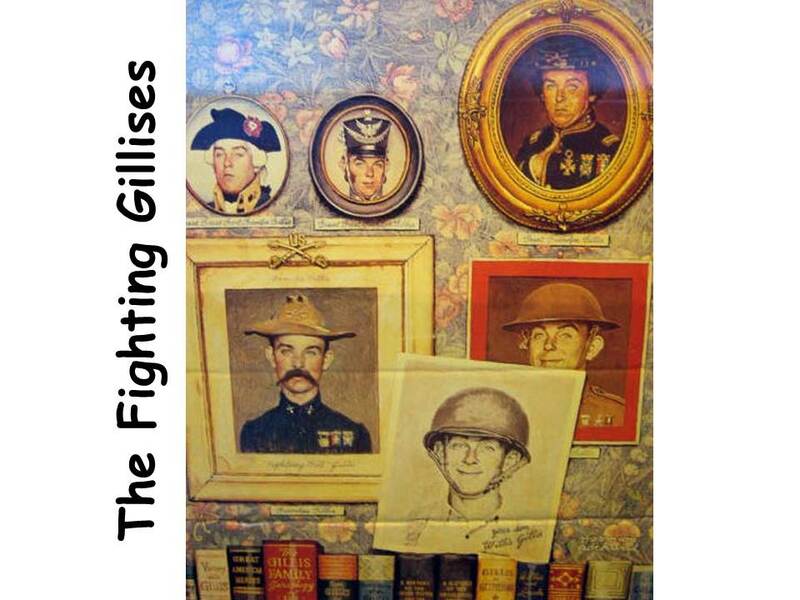 There is a Gillis for each war America has been involved in, up to Willie’s time—the Revolutionary War, the War of 1812, the Civil War, the Spanish American War, World War I and now World War II. Read the titles of the Books to the kids. • Bring in books with pictures of soldiers dressed in uniforms from the Revolutionary or Civil Wars. Have kids draw pictures of soldiers in those uniforms. • Bring in books with pictures of WWI or WWII aircraft. Have kids draw a picture of one of the planes. Talk about the nose art many pilots painted on the nose of their planes. Boys will especially love this. • Color maps of key places WWII was fought—Japan, Italy, Germany, France, England, Russia, Poland, etc. • Create a family tree with the names of Willie’s grandfathers. Norman was able to bring back the popular Willie Gillis, when Bob Buck returned to Vermont from the Pacific, after the war had ended. 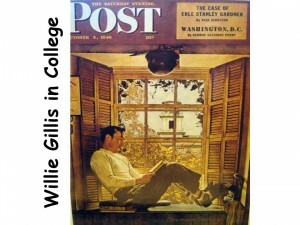 For the final cover in the Gillis series, Rockwell sent his subject to college. After weeding out a whole host of props, Rockwell eventually settled for only a few—the helmet, bayonet, insignia, discharge document, books and golf clubs—to describe where Willie had been and where he was going. For an authentic view from the dormitory window, Rockwell traveled to nearby Middlebury College to photograph the collegiate bell tower, which he referred to when he painted the cover later in his studio. Willie had come a long way from the innocent boy of the first draft call in 1941. 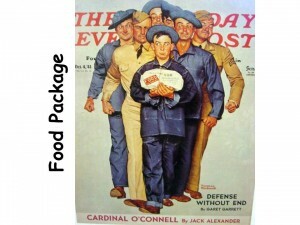 Willie looked like the youngest soldier in the first picture Rockwell painted of him (Food Package). He looked like a young kid. He looked too young to be a soldier. The Willie Gillis in this picture looks MUCH older. He is still a young man but he looks like a man and not a boy. Willie has grown up. Rockwell has painted him in a calm, mature pose. It seems as though Willie has adjusted well to civilian life. He seems quiet and contented. This last Willie Gillis picture gives us a happy conclusion to his story as a soldier. Rockwell would never have painted an unhappy ending to Willie’s story. He wanted to encourage people, to show them the good side of life. In 1946, America was happy. The war was over and the soldiers had come home.